Adams Morgan is a culturally diverse community in the heart of Washington, D.C. comprised of 19th- and early 20th-century row houses and apartment buildings and a wide range of restaurants, nightclubs, coffee houses, bars, bookstores, art galleries and unique specialty shops. Neighborhood restaurants feature cuisine from just about everywhere from Ethiopia and Vietnam to Latin America and the Caribbean. 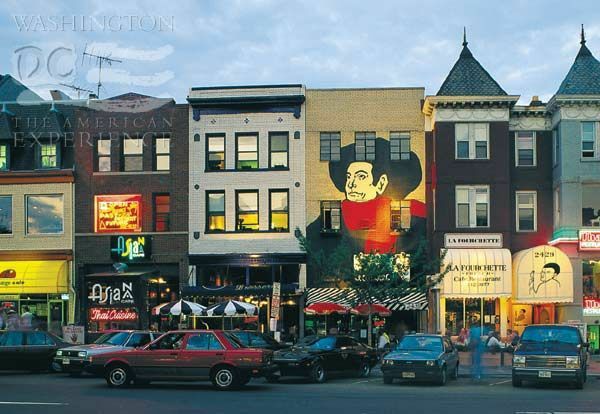 Adams Morgan is the center of DC's liveliest nightlife and is popular with young professionals. In 2014, the neighborhood was named one of the "10 Great Neighborhoods in America" by the American Planning Association. The area's ethnic diversity and colorful architecture make it a fun place to explore. Location: North of Dupont Circle, East of Kalorama, South of Mt. Pleasant, West of Columbia Heights. This funky DC neighborhood is known by locals to be the liveliest for nightlife. Parking spaces are scarce in Adams Morgan on Friday and Saturday evenings. On-street parking is available during the day. The best way to get to the area is by taking public transportation. The closest Metro Stations are Woodley-Park Zoo/Adams Morgan and U Street-Cordozo. From May through December, the Adams Morgan Farmers Market is open on Saturday mornings at 18th St. & Columbia Rd. NW Washington, D.C.
Each September, the community holds a street festival, called Adams Morgan Day and celebrates with live music, international foods, and lots of family friendly activities. Latin American Youth Center and Latino Community Heritage Center - The organization provides programs to support the social and academic needs of the Latin community. District of Columbia Arts Center - The non-profit organization provides a venue for emerging artists including visual and performing arts. The site offers classes and gallery space. Meridian Hill Park - The 12 acre park, located at the intersection of 16th and Euclid Streets, is one of the local favorites and a peaceful place to enjoy some green space. The Adams Morgan area was originally known as Lanier Heights and was a fashionable, middle-class neighborhood. The name of the community was changed to Adams Morgan following a period of decline in the 1950s-60s and was derived by combining of the names of two formerly segregated elementary schools, the predominately white-attended John Quincy Adams Elementary School and the black-attended Thomas P. Morgan Elementary School. Since the 1970s, Adams Morgan has continued to grow and prosper into a vibrant neighborhood and a desirable place to live.